Cloud is shaping EDA like never before. Today, we are releasing the full InTime tool on the Plunify AI Lab platform. 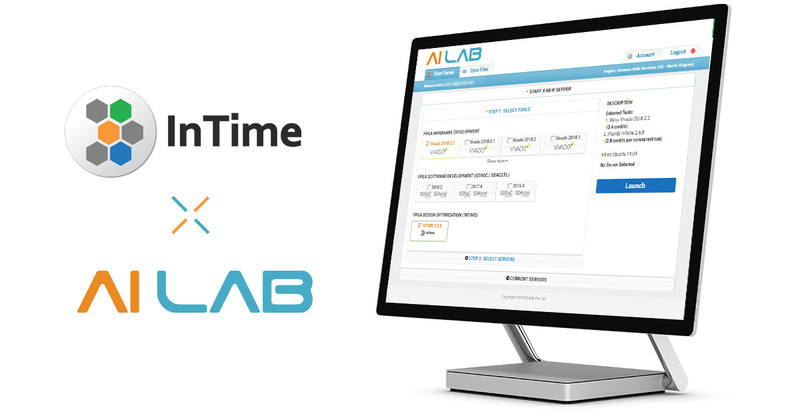 InTime is officially included on AI Lab as one of the tools on the Plunify Cloud eco-system. This combines the cloud’s massive compute power to the ubiquitous of AI Lab platform to benefit more FPGA designers. You can now optimize any FPGA design on the cloud at your convenience. To use InTime on AI Lab is simple. After registering a Plunify Cloud account, use the account credentials to log in to AI Lab console via any machine’s browser. Select InTime (with a Vivado tool) and your preferred server, then you are ready to go! Each new user of Plunify Cloud will enjoy 50 free credits, you may need to add more credits to continue running. Using higher powered servers with more cores (= more concurrent runs) will consume more credits but provide faster turnaround time. The InTime software optimizes FPGA designs based on machine-learning driven explorations of synthesis and P&R settings without changing RTL. While this approach preserves the original design, it does require more compute power. After all, there are millions of combinations of FPGA tool settings. To identify the most effective one for a specific design is not an easy task. That is where machine learning steps in – decrease the design exploration space. Another important piece is cloud computing. InTime can run compilations concurrently, and using cloud computing reduces runtime and speeds up exploration. However, we know that setting up and running a cloud deployment, is not something FPGA design engineers do day-in and day-out. This is where Plunify AI Lab platform comes in handy. One of the aims of the AI Lab virtual environment is to provide convenience for FPGA designers. Its operation is based on hosting a virtual desktop on a remote cloud server. The user can compile a FPGA design on this virtual desktop with just a browser. For the very first time in EDA history, users can access design tools like Vivado on a very basic machine like a Chromebook, anywhere and time. Last but not least, if you have already installed InTime locally and want to try out the cloud servers, simply set “Run Target” as “Plunify Cloud”. The result will be exactly the same as running InTime on AI Lab virtual desktop. Register a Plunify Cloud account, use the account credentials to log in to AI Lab via any machine’s browser.